Each of our unique rings is crafted individually by one of our specialized Mokume Gane craftsmen. They will make your rings using techniques developed by craftsmen of the Edo period. In comparison to other types of general or handmade jewelry, the manufacturing process for Mokume Gane is a great deal more labor-intensive and time consuming.It is therefore not possible to mass-produce Mokume Gane. Mr. Takahashi, the founder of Mokumeganeya, has made it his life’s work to research the restoration of this technique, which is considered a cultural property. His accomplishments are reflected in our Mokume Gane rings. You may feel that our prices are a little higher in comparison to rings in general but this is because all of our unique rings are custom-made. The process of making unique Mokume Gane rings is about 10 times more labor-intensive and time consuming than for general rings. For instance, making a pair of unique Mokume Gane wedding bands requires twice the amount of work compared to hand-made platinum rings. We use a process that has been handed down since the Edo period, and which has matured and developed over time to bring more variation to an ancient technique. Because of the complexity of the manufacturing process, our Mokume Gane cannot be mass-produced, so your unique wedding bands will be very special. The average purchase price for our unique engagement rings would be around JPY 300,000 (US$ 3,000.00), and for our unique wedding bands, it would be around JPY 300,000 (US$ 3,000.00) for a pair. All of our jewelry is custom made, so prices can vary according to your design details, as well as your finger size. Please contact us if you have a particular request for prices. “Tsunagaru-Katachi” is a concept that allows you and your partner to share two unique wedding bands created from the same plank of Mokume Gane. You can choose your favorite design and, if you are in Japan, also experience the sharing ceremony. Place an order ===> 4 weeks ===> Ceremony at store ===> 3 weeks ===> Pick up your ring at the store *The process timing may change depending on the design. We will keep you informed at each step. For the ordering process, please click on the link below. The flat band we use in the image of the “sharing ceremony” is a Good Design Limited edition. You can also do the “sharing ceremony” with different designs or different color combination. You can in fact do the sharing ceremony with any Mokume pattern rings. Please let us know your favorite designs and we can give you more information. Yes, as long as you are in Japan, you can experience a sharing ceremony, but please kindly mention this when you first contact us, so we can plan the schedule together. We need about 4 weeks to prepare the ceremony rings for you. Yes, if you are having a sharing ceremony in Japan, we are able to adjust the ring size. Please note that if we need to make the size bigger, we will need to add a single metal plate to the bottom of the ring. So, if you are hesitating between one size larger or smaller, we recommend that you order the bigger size. And we can make it smaller if need be after your sharing ceremony. It usually takes about 1.5 to 2 months to make a Mokume Gane ring. It may take longer depending on the design. This is because it is very important for us to concentrate on making our unique wedding bands one by one, as fully order made. *Japanese national holidays will influence the delivery dates. Please kindly let us know at your first contact if you have a request of your ring receiving date. We have 19 stores in Japan. Please ask us for your closest location. We can also accept email orders. We can have design meeting by email, and you can also place your order by email, and we can make both international / domestic shipment for your ring. For our email order process, please go to the “Order process” page on our website. Yes, you can place an order form overseas. We also ship overseas, but please kindly understand that there are some countries we cannot ship to due to their custom regulations. Please contact us for details. If your country happens to be one we cannot ship to, you could perhaps ask a friend who lives in Japan for delivery help. Or if you have any plans to come to Japan in the near future, you can place your order in advance, and you can pick up your unique wedding bands at one of our stores while you are in Japan. Please click on the link below for the email order process. Here are the countries to which we have experience sending package via FedEx and UPS. For other countries, please contact us. We create our Mokume Gane patterns by using platinum 900, 18K colored gold (white gold, pink gold, yellow gold, green gold) and silver 925. We need at least 2 colors to create a Mokume pattern. You can choose any color combination you like for your unique wedding bands. If you are considering a ring width of 3.0mm or less, we would suggest to choose up to 4 colors or less so as to keep the color and pattern appearance clear. 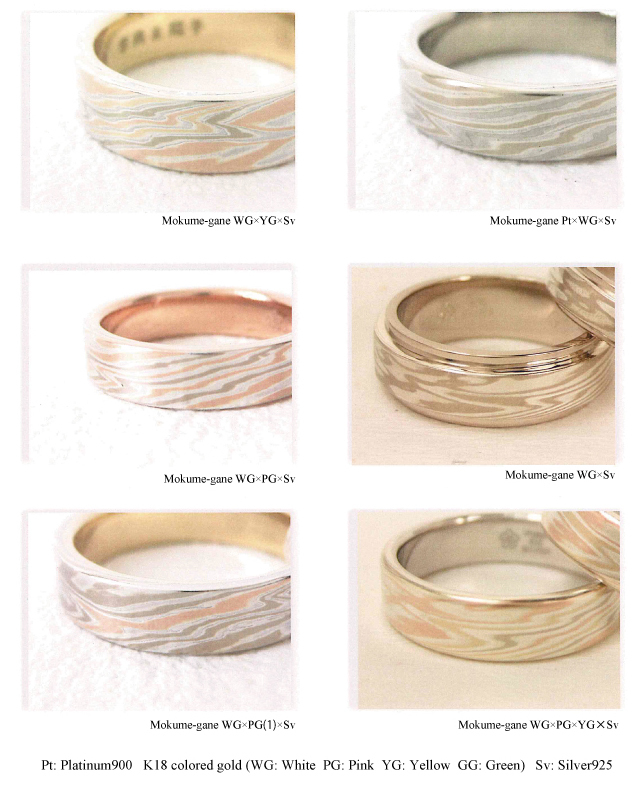 Please see our Mokume Gane color combinations below. We use silver so that the patterns stand out clearly, but we can also make Mokume Gane using only 18K colored gold, or 18K colored gold and Platinum.Please contact us for details. You can chose your favorite color combination, but we cannot make colors darker or lighter. Neither are we able to make certain colors show up more. All of our unique wedding rings are handcrafted, and color appearance is created at random, which makes our rings very special!! We make Mokume Gane with materials that are suitable for life-long wear. In the Mokume Gane making process, it would be easier to use 24K gold or platinum, but they are not as durable. On the other hand, the harder gold such as the 18K is ill-suited to the process of making Mokume Gane. But through our Mokume Gane research, we were successful in making it possible to use harder materials in the Mokume Gane manufacturing process. We are also using Silver 925 instead of pure silver out of concern for the ring’s durability. Unfortunately we cannot take your own diamond and set it into our MOKUMEGANEYA rings. Yes, we can set other stones for side stone. We have a collection of colored diamonds and colored stones for side stones. We use between 0.25ct to 0.30ct diamonds for the images of our unique engagement rings. But we can also set smaller or bigger sizes of diamond. Every gemstone used in our unique engagement rings was mined from the earth. We do not sell synthetic or laboratory created gemstones. Yes, we can set other stone for main stone. However, it depends on ring design, stone size and shape.Please ask us for details. Yes, we can do engraving！We can engrave up to 20 letters for a wedding band and 10 letters for an engagement ring. But it is also depending on the ring design you chose, so please ask us for details. Most of the time, we can, but we need to see and check with our craftsmen if we are able to do it or not. It really depends on the letters and also the ring design you select. So please let us know the details of your engraving request, and we can let you know if it is possible. For engagement rings prices start from JPY 153,000~ (US$ 1,486.00~) without a center diamond. For wedding bands, starting from 2.5mm JPY 280,000~ (US$ 2,719.00~) without diamond. But the price can change depending on your finger size, ring width, and other design details, so please contact us for pricing. Yes, we can. If you would like to make a ring for a baby from the same mokume plank as your unique wedding bands, please let us know at the design meeting. Yes, we also have collection of pendants, tie clips etc. Please contact us for more information. We suggest that you are tested at a dermatological laboratory to find out exactly which materials you are allergic to, so we can choose materials that you are not allergic to. If you cannot visit our store to measure your size, we have an international ring conversion chart you can use. The ones we have in our stores are all samples, and they are not for sale. If you are in Japan for a short visit, you can place an order at a store, and we can ship your ring to you, so please let us know. Please be aware that there are some countries we cannot ship to due to customs Regulations. Please ask us for details. Yes, you can. Please let us know the dates of your visit, so we can schedule together. *Please note that we are not able to hand over rings unless payment has been completed in full. We do not include import tax in our prices. The percentage of tax is different from country to country, so please kindly contact your local customs office for information, or contact FedEx or UPS customer service. We will send your package via FedEx or UPS. Delivery usually takes 4-5 days but it depends on the country, the time of year, and customs clearance.We are not able to guarantee an exact delivery date. Unfortunately, we are not able to promise you an exact arrival date for the package due to the possibility of an unexpected customs inspection. But you can let us know your requested date of arrival, and we will try to make the shipment as early as we possibly can. So please let us know. We wish we could, but unfortunately, there are some countries FedEx and UPS cannot deliver to due to custom regulations. Please check with us. If you have plans to travel to Japan for a visit, you can place an order in advance, and you can pick up your unique wedding bands at one of our stores in Japan, if your country happens to be one that FedEx and UPS cannot deliver to. We pack unique engagement rings and unique wedding bands in the customized paulownia wood box. 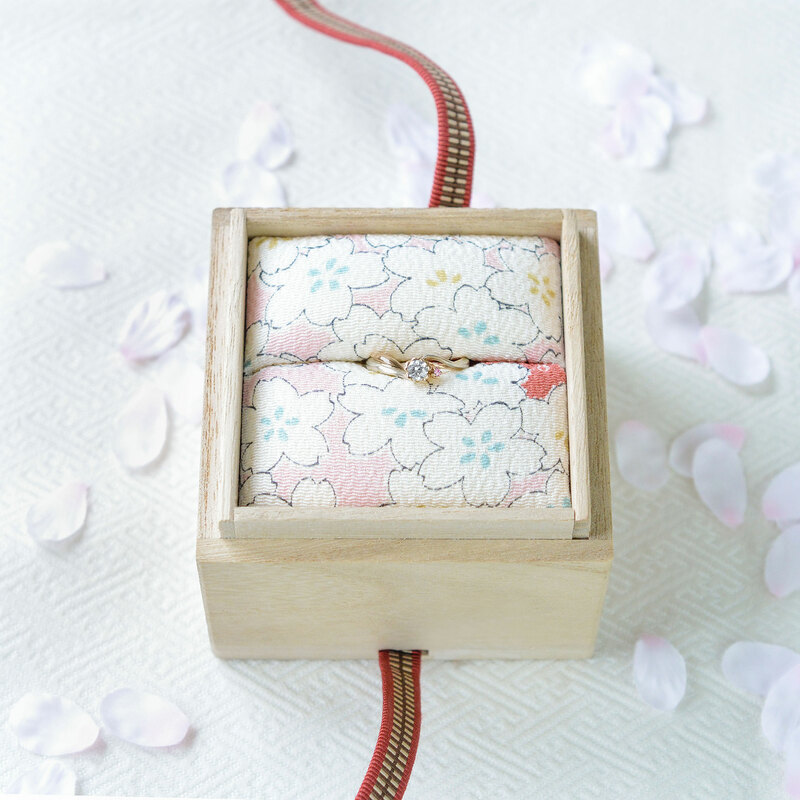 Inside of the box, we use the beautiful traditional craft 京友禅, “Kyo-Yuzen”cushion and wrap the rings gently. In addition, we use 真田紐, “Sanada string” which we order from Kyoto to tie the box. It is said to be a auspicious string from the fact that it can not be split, no matter how hard you try to do so. For the center stone of our unique engagement ring, we attach certificate of the appraisal agency. *However, it is limited to the stone which you purchased from us. For other items than ring (ex. Pendant, earing) , there are cases you will have certificate. In addition, our own guarantee for maintenance is attached to all our products. Basically, it takes three weeks. However, it depends on the design and holiday break. we can offer express service for them. For more details, please contact us.